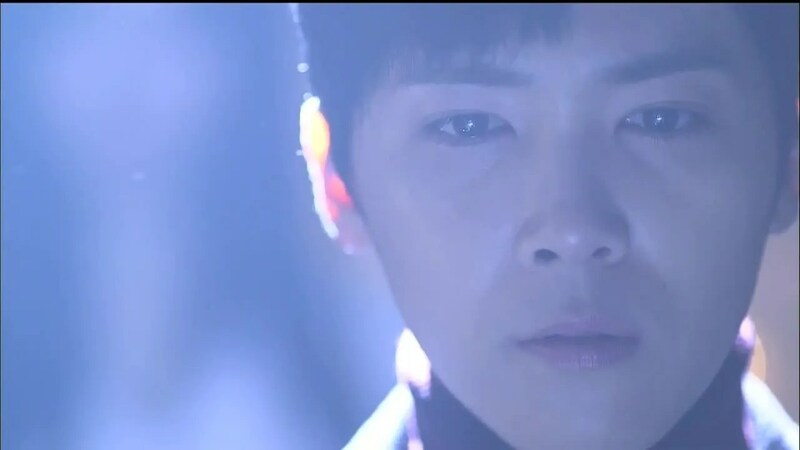 Lee Hong-ki killed me dead in this episode. Seriously, the way he portrays Kang-joo’s douche-y brand of love seriously got to me. Maybe ’cause that douche-y brand of love ain’t quite so douche-y anymore. Plus, it’s sprinkled with kittens. I likes kittens. We left off at the impromptu concert organized by evil Roo-mi. Suddenly, Doo-rim starts rocking the piano, which means it’s not Doo-rim, but Yi-kyung. (And it’s a cover of the theme song “Come Inside/들어와” normally sung by FT Island’s Lee Jae-jin.) The sound of music stops Yi-hun’s assault on the fire alarm, shocks the hell out of Roo-mi, and ensures that all is right with the world for all of two seconds. Flashback to Yi-kyung overhearing Yi-hyun talk about the surprise concert on the phone. She powows real quick with Creepy Mom Jae-ran on the phone and then books it to the orphanage to save Doo-rim from humiliation. 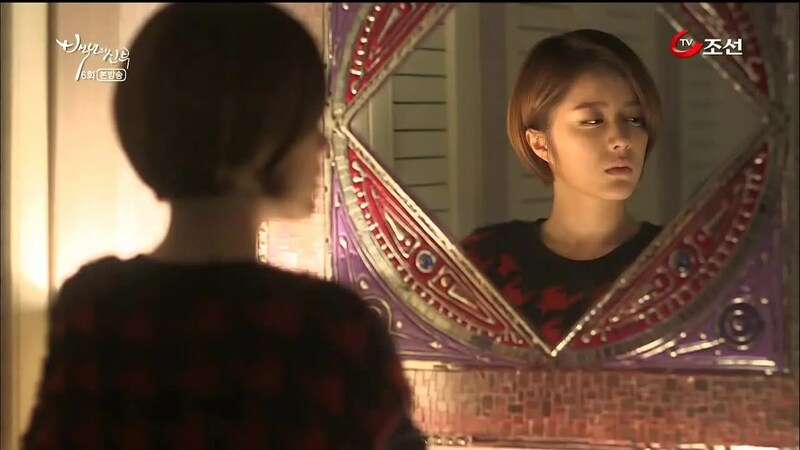 She enters and Doo-rim stares at her doppelganger. The one-song concert is a rousing success. Yi-hyun finds Doo-rim pitifully hiding while Yi-kyung receives applause and smiles from Kang-joo. (I love that I hate her and it’s the same actress. That’s awesome sauce.) Yi-hyun looks a little constipated by the news that the pianist was his sister. Creepy Mom pretends to be surprised to see Yi-kyung. Yi-hyun is concerned with the circumstances of her return but the women play it off by being “oh-so-happy” to see each other. Then, Yi-kyung scolds him and says she’s kept up with everything. She was mad when there was a fake pretending to be her and messing up her life so she came back to prevent further trouble. Creepy Mom says Yi-kyung to rest, leaving Doo-rim with Yi-hyun. Doo-rim says Yi-kyung’s timing was perfect and while she’s impressed, Yi-hyun is suspicious of the perfect timing. Doo-rim is also the charade is over: no more heels or small dresses. Hehe. Yi-hyun is glad she doesn’t have to meet Kang-joo anymore, which Doo-rim interprets as worry her identity would be revealed. We all know that it’s for the creeptastic reason that he likes her. Kang-joo’s family drinks tea together and Kang-in complains of its bitterness. He fusses with his brother, but Dad is happy to hear it. It means Kang-in is home. Kang-in says it’ll get louder when “Yi-kyung” moves in after the marriage. Then he shows off the selca of her and Dad with dots on their faces that she posted online – her outgoing personality is just his style. Oh, this makes me sad at how doomed this whole situation is. I like her with Kang-joo and Kang-in. Dad wants to call Yi-kyung over for dinner, just because. Mommy Myung-hee fights it, but her refutations dwindle into pathetic excuses. Doo-rim visits Yi-kyung who is cold and ungrateful. But the reason for her visit is to get a good look at Yi-kyung. It’s a bit startling how much they look alike. Yi-kyung wonders if she had plastic surgery done, but Doo-rim doesn’t have the money for that. Ha! It’s not like their relatives or anything, either. It’s just bizarre. Watch them turn out to be relatives or something. And don’t think I didn’t notice that Yi-kyung is dressed in dark colors and Doo-rim is in white. Nice play, there. Doo-rim is thankful she can return to Namhae without any worries since Yi-kyung returned safely. Yi-kyung says she’s not thankful because the marriage is still on and Doo-rim forced her to come back. Doo-rim tries to extol Kang-joo’s virtues – he isn’t that bad. Well then you marry him, Yi-kyung replies. He didn’t notice his fiancee was a different woman, how can she be okay with that? Yi-kyung rudely asks her to leave, and Doo-rim kindly hands her a list of things that have happened with Kang-joo so there won’t be any problems. She also returns the phone, which rings with the dinner invitation from Dad. Doo-rim looks a little sad to be so suddenly on the outside. Creepy Mom gives Doo-rim an envelope of money. Pause. Right. There. Aren’t they broke? They haven’t received any investment I know of. I thought Yi-hyun would give her the shop after the Taeyang group money came in. Doo-rim doesn’t want to accept the money, but Creepy Mom spins the gesture into a mother giving her daughter spending money. Ew. No. Then she gets even grosser, takes Doo-rim’s hand and tells her that she thought of her as a daughter. Where are my nunchucks? I’m going to beat you! You’re using her need for maternal love against her. Doo-rim buys it hook, line, and sinker. Then Creepy Mom asks if she wants to live in Seoul – she could see up a business for her. Doo-rim loves the idea, but needs to check with Granny first. Creepy Mom doesn’t like that idea. Good. Frown, woman! FROWN FOUL BEAST! Yi-hyun contemplates the receipt in the dark. Yes, brood away. Doo-rim packs her bag. Oh, is she going to get the kitten??? I’m not sure, but she does pull out the jacket Kang-joo draped around her. Her memories with him make her sad. Yi-hyun and Doo-rim come down with Doo-rim’s things. She is going to pick up her kitten (YAY!) first, and then go home. As she leaves, Yi-kyung watches menacingly, promising not to let her go that easily. 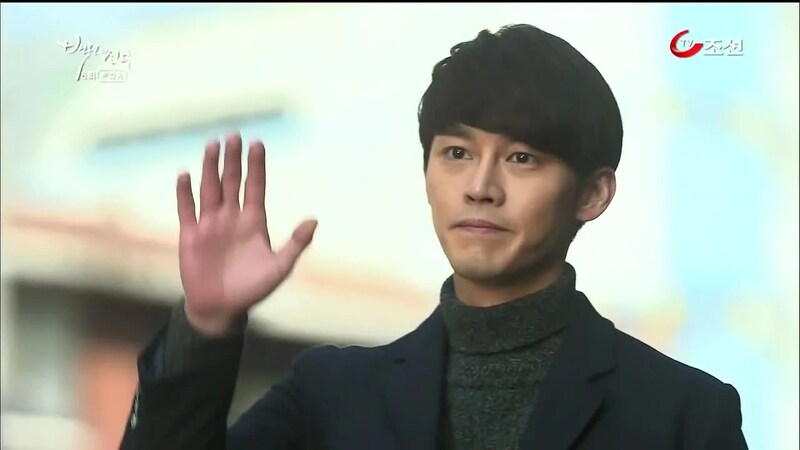 Doo-rim smiles and waves goodbye to Yi-hyun who looks heartbroken. He flashes back through memories with her and then runs after her, but too late. She’s off on a bus to see Jin-joo who is surprised she doesn’t have to “be a princess” anymore. Then Doo-rim gives Jin-joo the money to pay off her debt, the money that Creepy Mom gave her. It’s payment for taking care of the cat and other things. They have a moment while I try not to be annoyed about the lack of thought that she puts into things. Doo-rim wants to return the jacket Kang-joo let her borrow, but nearly runs into him instead.In her hurry to hide, she leaves the cat carrier behind. Kang-joo pulls out the kitten, takes one look at the conspicuously hidden Doo-rim behind a column and slides onto the floor next to her. “Are you playing hide-and-go-seek?” he asks. 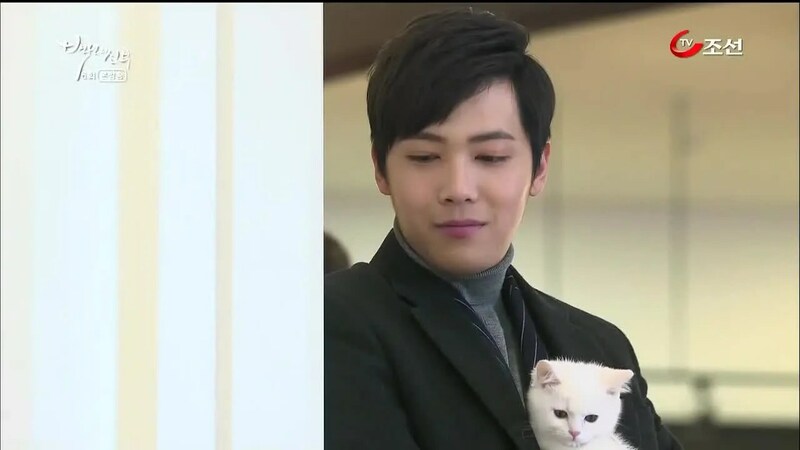 I had to rewind this because Lee Hong-ki + kitten = TOO CUTE! Doo-rim lies that she’s taking the cat to a different friends house, and Kang-joo reminds her not to be late because of it. She returns the jacket and he takes it with the offhanded remark that she could’ve just brought it tonight. Then he leaves and she solemnly watches him disappear, quietly saying her goodbyes. Kang-joo finds roasted sweet potatoes with his jacket and is happily chowing down when Secretary Kim comes to drop papers off. He hides his sweet potato, but is caught and awkwardly offers him two, much to Kim’s amusement. Hehehe. Then he continues to eat with a smile. D’aw. Mrs. Jang presents Yi-kyung with a fish and I revel in the look of disgust on her evil, evil doppelganger, murderess face! Yi-kyung is left with the fish and screams when she tries to touch it. Her excuse is that she overworked her muscles at the concert. Yeah…whatever. Mrs. Jang is a little weirded out by her. Yi-kyung looks at the pictures while waiting. 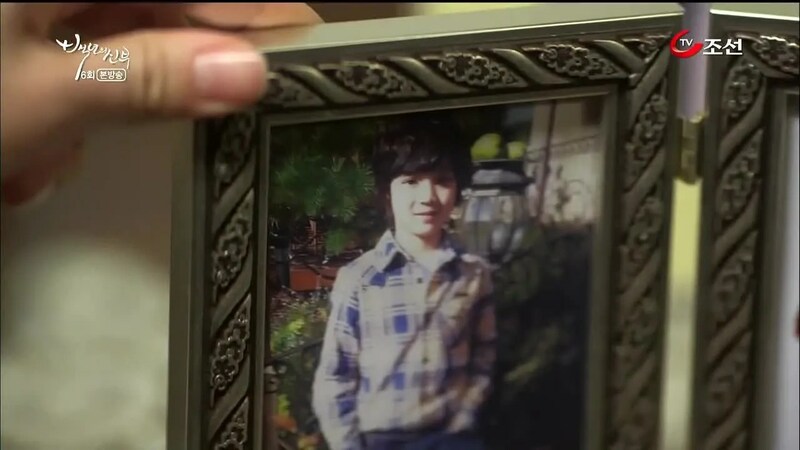 We’re treated to a picture of young Lee Hong-ki and then the family picture with the image of the woman who became the ghost. In a flashback we see Yi-kyung asking Dad who the “woman” in the picture is. He doesn’t know. Jump to the Psychic telling Creepy Mom about the curse and the fact that Mommy Myung-hee knows about it. The only way to be sure is to go back in time. OMG are we gonna get time travel, too? I’m scurred. End flashbacks. Cue Kang-joo. My heart actually tightened at the look he gave her. He starts to tease her about how the sweet potatoes aren’t enough for the cut he got the other night while Yi-kyung looks mighty confused. He continues in his adorably backwards way of flirting that he won’t make her pay him back for it so she can save money. He’s feeling generous. She says nothing until goaded and sends him in to see his father. Aw, I hated that exchange. Show, you did it. You got to me. Yi-kyung picks at her food and Dad notices. Mommy Myung-hee blames it on pre-wedding jitters. They also noticed her subdued behavior. Dad invites her to the study when she’s through. She does so and brings him tea. He congratulates her on her concert and gives her an envelope to curry her favor, but we all know he’s really just doting on her/Doo-rim. His real reason, however, is to have a rematch of Alkkagi, the game they played earlier where they flicked Baduk pieces around. Yi-kyung is majorly confused and awkwardly goes along with everything. On the bus home, Doo-rim plays with kitten and remembers she forgot to write about the alkkagi game in her notes. Cut to a very annoyed Yi-kyung staring at her spotty face. I hope those become permanent, witch. Doo-rim is ecstatic to be at home with Granny who asks if she’s met any Seoulite she’s interested in. Doo-rim mentions a man she met who is mean and only likes women with big chests. Those men cheat after marriage, Granny says. It’s not right, Doo-rim sadly confirms and they settle down to sleep. Or, she tries, but cannot. It doesn’t escape Granny’s notice. Mrs. Jang brings tea to the family shrine/the old bridal chamber. Apparently, Mommy Myung-hee ordered her to bring that tea there every night and she’s been doing so. Tonight there are a pair of sneakers outside. Suddenly, Kang-joo bursts from the door, scaring her and leaving her panting for breath. He smiles *squee* at her fear. Mrs. Jang admits the place freaks her out and he’s weird for hanging around it since he was a kid. Kang-joo says the place is a good place to think and enjoy naps, which shocks the hell out of Mrs. Jang. He doesn’t find the building odd? That’s why she’s eager for him to marry, because she’s worried. Worried about what? His past trauma? The curse? He assures her that what she is worried about won’t happen. Mommy Myung-hee decides to pop into the conversation, so Mrs. Jang leaves and Mommy Myung-hee tells him not to listen to rumors or talk about them. You’re evil. You’re going to let him suffer through that with no real warning? Death is big, you jerk. 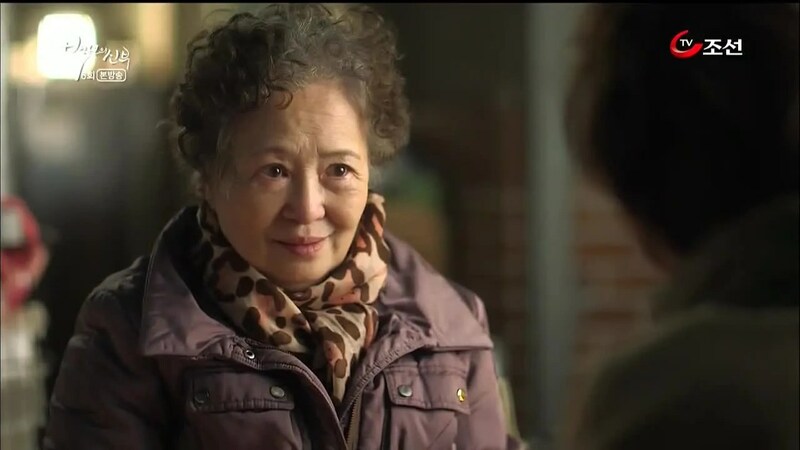 Mommy Myung-hee continues to be a jerk and scolds Mrs. Jang for opening her mouth about “useless stories.” She also forbids her from mentioning the building to Yi-kyung. The next morning she and Creepy Mom set a wedding date. Mommy Myung-hee wants a simple wedding and a simple dowry, no doubt to keep Creepy Mom from bolting. They give each other evil looks. Doo-rim sits on the seashore looking at her lucky bracelet. Since it didn’t bring her any luck with love, she chucks it into the ocean. Suddenly, the Jumper from episode one shows up demanding to know why she threw it away. She is TOTALLY the ghost! And how is Doo-rim not suspicious of her sudden appearance??? Anyway, she’s peeved that Doo-rim treated the bracelet so lightly. Doo-rim wants to know why the Jumper won’t leave her alone, and Jumper beckons her (like an animal, palm up) to come closer and find out why. Doo-rim takes it as a challenge and marches closer. Jumper asks her to step even closer, then asks for 500 won (about 50 cents). HAHAHAHA! Jumper says the bracelet will give her anything she wants, which gives Doo-rim pause. Doo-rim chooses the bracelet while blathering excuses. The second she puts it on, Yi-hyun honks a car horn on the seashore. See? says Jumper. It works. She also tells Doo-rim to be prepared to take on everything that comes her way. Jumper ghost smirks as Doo-rim runs to Yi-hyun and takes him to Granny’s restaurant where she serves up a feast. She proceeds to tell him he’s very good-looking and even puts a piece of fish on her spoon. He’s touched by Granny and also surprised at her similarity to Doo-rim. After the meal, he gives Granny gifts of Oriental medicine and a mink scarf. He also tells her that she can use banmal with him, which is really sweet and she cuts to it immediately. Yi-hyun walks with Doo-rim on the shore and wonders if she’s asked Granny about the Seoul restaurant. She hasn’t yet – the ocean is Granny’s home and her parents’ final resting place. She says her parents died when they went out fishing – she thinks they died at the same time because they loved each other so much. He takes her hand and she smiles up at him, thinking his hands are warm like her father’s. Roo-mi brings Mrs. Jang expensive cosmetics. A bribe, no doubt.. Roo-mi asks how long she’s been working there; 30 years. There isn’t anything she doesn’t know about the Choi hanok, so Roo-mi should ask what she wants. Roo-mi asks about the curse, and Mrs. Jang let’s it slip that the curse is mentioned in Kang-joo’s grandmother’s will. She tells Roo-mi the secret about the detached building/shrine/bridal chambers out back. Mommy Myung-hee asked that it be protected and cared for. Roo-mi remembers that Mommy Myung-hee said everything will find it’s rightful place. Then she smirks like the evil wench she is. Granny sends Yi-hyun home with lots of food. Creepy Mom asks about the restaurant and is disappointed to hear that Doo-rim couldn’t bring it up yet. She fakes concern for Doo-rim as a “daughter.” If she lived close, she could take care of her. Yi-hyun should try to talk to her about it. Granny and Doo-rim work on preparing vegetables and chat. Granny wonders if Yi-hyun likes her, which Doo-rim denies like a fool. After a few minutes, Doo-rim segues into the big question: would you like to live in Seoul? Granny doesn’t have enough money to live there. Doo-rim explains Yi-hyun would open a restaurant for her, but she hasn’t answered him yet because she wanted Granny’s opinion. No answer yet. The next morning Yi-hyun is putting on his tie. Yi-kyung doesn’t like it and wants him to change it, but he doesn’t want to. It must be the one from Doo-rim. Yi-kyung asks if he’s dating anyone because he’ll be bored alone once she’s off and married. She finally figures out that the necktie is a gift from a girl, one he likes. He doesn’t confirm, but it’s obvious. There is only one consolation I get from this scene: he has no weird lusty/love/like vibes towards his sister and doesn’t look at her like he looks at Doo-rim. I still find the situation weird. Creepy Mom gives Yi-kyung the ring that Kang-joo’s grandmother passed down while they are ring shopping. Roo-mi sees them and gives Yi-kyung a congratulatory gift. Why? She’s given up. At first she was suspicious because the face was Yi-kyung’s, but she didn’t feel like Yi-kyung. The piano concert put things in perspective for her. Roo-mi apologizes and Yi-kyung forgives her. Then Roo-mi asks to catch her bouquet and thinks evilly that Yi-kyung won’t live long enough to wear the gift she received. The gift is lingerie, of course, which she brings to Kang-joo. I love how he’s unphased by it and doesn’t drop it like a hot potato. Thank you for a real man, show! Then he wonders if it would look good on her and holds it up. Awwwww, he likes her! He teases her that she shouldn’t wear it with the scary make-up from “that one time.” Then he notices she isn’t wearing her “lucky” bracelet. She lies that she got sick of it. Granny fawns over her gifts and is sure Yi-hyun likes Doo-rim. She wonders if Doo-rim is losing sleep over him. That drives Granny to tell her: Doo-rim ah. Let’s go to Seoul. Butler Jang hands Dad some information on a Hong Man-soo, Kang-joo’s grandmother’s chauffeur. He’s been home alone since the grandmother is traveling. 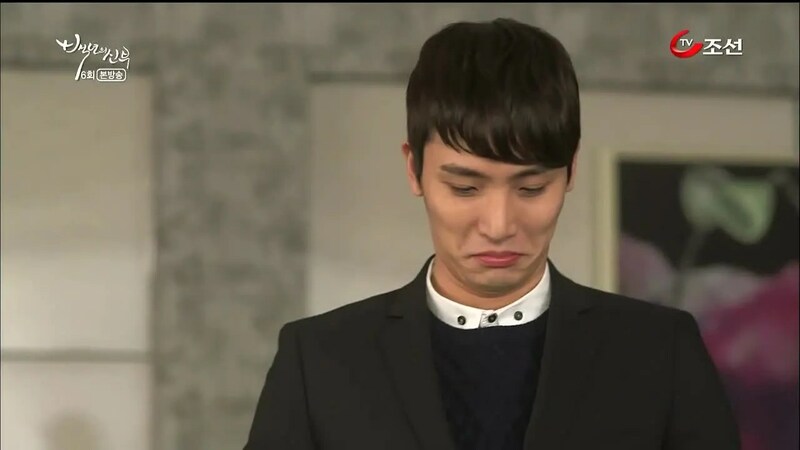 Butler Jang asks if he should dig further? Dad watches Mommy Myung-hee walk to the detached building. She reads his dead wife’s journal: she doesn’t care if she dies because she loves Dad more than life itself. Dad asks what she’s hiding and he forces the box open. It contains the journal and a shoe that she says she’s been caring for due to his mother’s final wishes. Dad wonders if she has any underlying plans for the kids’ marriage like his mother did. His mother didn’t fight his choice of woman despite her low status. He didn’t learn why she didn’t oppose until afterwards. She better not be thinking of doing the same thing to Yi-kyung. Mommy Myung-hee knows he won’t believe her anyway so he should just believe what he wants. Wow, she’s horrendous. Dad realizes she believes the rumors about their family, which Myung-hee tries to pass off as concern for Kang-joo. Dad quickly shuts her nasty face up and says he’ll never forgive her if she has nasty plans for Yi-kyung. And…outside the door, while very dramatic background music plays, stands a horrified Kang-joo! DUN DUN DUN! He demands of his mother to know if what he heard was the truth. She had said that it was all a made up story. Is that why she chose Yi-kyung instead of Roo-mi? He’s disgusted and won’t even give her a chance to protest before walking away. 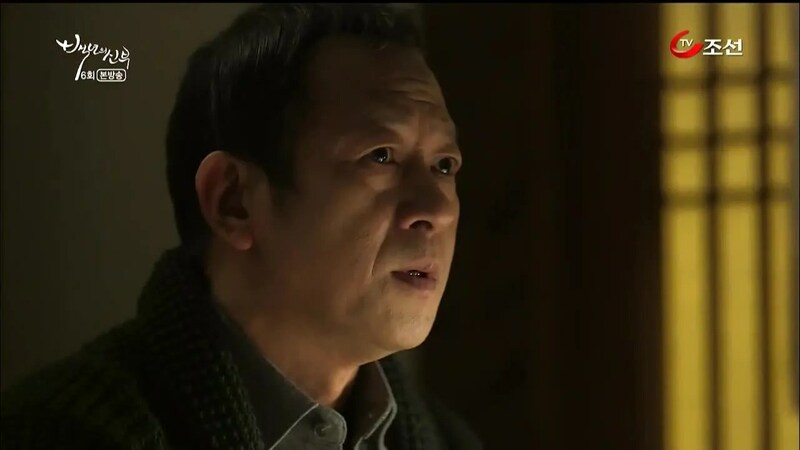 The dramatic background music fallows Kang-joo into his room where he slams his hands on the desk and tries to digest what he’s heard. Then he goes back to the detached building. He tells the lighted candle that he didn’t think he had a heart. He didn’t want to give his heart away. For the first time he has. He turns away and the ghost appears in a wash of light. “You came,” he says calmly. Wait, he said that like he’s talked to the ghost before…why did I not see that coming? How many of you saw that? I must be dense as hell. I should’ve guessed that. Damn my 20/20 hindsight bias. I knew he’d been strangely calm about the detached shrine building thing. I KNEW IT. Kang-joo is friends with the ghost! I need to watch the next episode now! Wait, comments first! So this ghost, she seems to be on Doo-rim’s side. 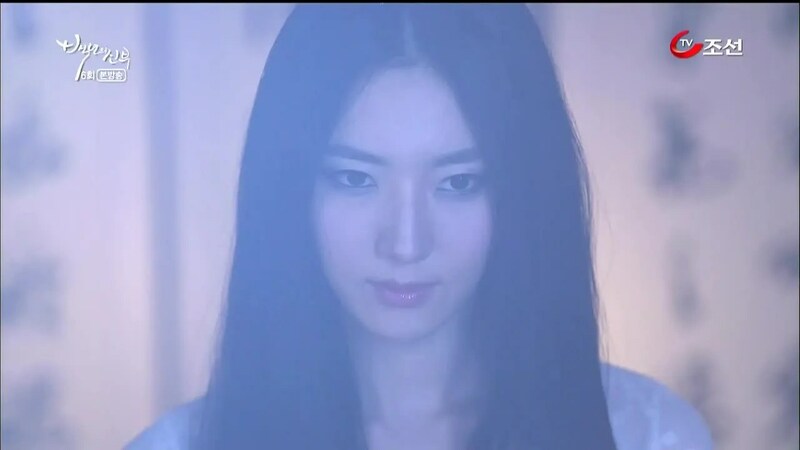 At least when she haunts Doo-rim she does it in corporal form while she chooses to scare the crap out of Yi-kyung. I like that. But I don’t get why Dad keeps having nightmares. They could just be nightmares, or they could be ghost induced. It seems like knowledge of the ghost’s curse turns every woman who hears it into a heartless person. Mommy Myung-hee has been planning a sacrifice for years because that’s how she got her marriage. Creepy Mom decides to sacrifice Doo-rim over her daughter. This one is a BIT more understandable except for the fact that Creepy Mom seems incapable of loving at all so her motivations don’t seem love based but greed based. Then there is Yi-kyung who hears about the curse and turns EVIL when she had a little bit of sympathy going for her before. And last is Roo-mi who is just gonna kick back and relax while Yi-kyung gets murdered by a ghost so she can marry Kang-joo. FOUR psycho women in this show. FOUR. I’m up to my neck in crazy. I really wanted Yi-kyung to be pitiable. This stark change makes her hateable which is good and well, but i liked that she garnered symptathy before. She was less of a black-and-white bad guy. I like my villains with a little bit of angst. However, Yang Jin-sung does such a wonderful job with Yi-kyung. A frosty wind blows when Yi-kyung is on screen. She barely makes any connection at all with Kang-joo. And then Doo-rim enters and it’s like the world can breath again. She has adorable chemistry with Kang-joo. The scenes that got me were the one in the mall with the kitten. They had such a beautiful connection, both just barley in love. And then he’s thrown into a room with Yi-kyung and is baffled out of his mind by the difference. Poor thing thinks it’s just a bad day or something. 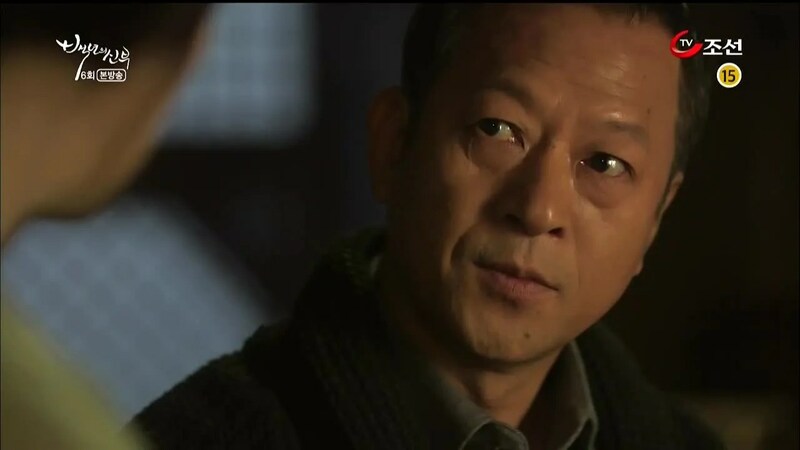 In any case, Jin-sung ssi is doing an amazing job. Lee Hong-ki is so awesome. I haven’t mentioned that enough. He manages to make prickly Kang-joo have this wonderfully soft underbelly. His pride is pretty intense, and his jerky reactions to things need some improvement, but when push comes to shove, he’ll run up multiple flights of stairs to get to the rooftop to save his girl. There was separation this episode, but it wasn’t the noble idiot kind. 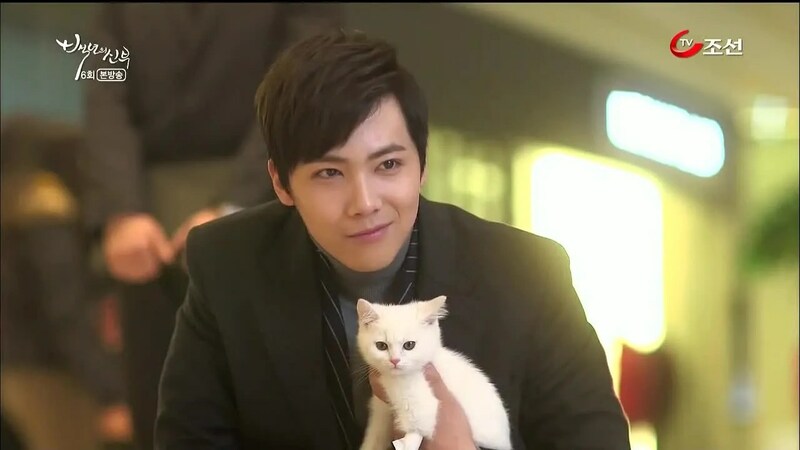 It was a separation that was due to occur and gave us that wonderful “kitten in the mall” scene. It gives Doo-rim time to figure out her feelings while we are left angsting over poor Kang-joo getting stuck with the EVIL EVIL ICE PRINCESS FROM HELL! I’m wondering how they’ll get him and Doo-rim back together. The way the Seoul restaurant was offered wasn’t the most logical. (Creepy Mom is broke, remember?) But Granny’s wish to marry off her beloved grandkid before she dies is genuine, pure and amazingly sweet. She’s willing to move from her seaside lifelong home to help her grandkid find happiness. That’s awesome. Please don’t put her in the hospital again. I have to admit, Yi-hyun was heart-wrenching this episode with his feelings for Doo-rim. He so obviously loves her like a woman and Yi-kyung like a sister. 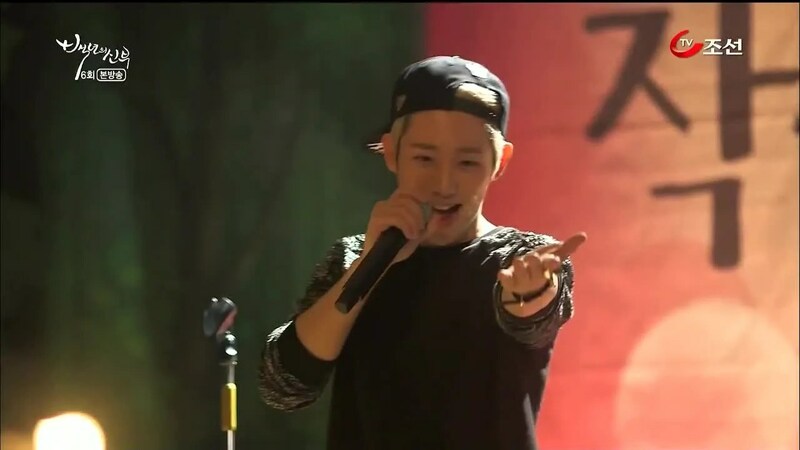 Doo-rim is so sweet that she accepts his gesture like those from a brotherly oppa, not a romantic one. So with all the inconsistencies of this show, it has a magic way of sucking me in and making me love it. Watching Doo-rim overcome the odds is part of it, especially when she’s battling four evil witches. Watching Kang-joo melt little by little is part of it. Watching him attempt to flirt with her is part of it. The curiosity about the ghost is part of it. Basically, the show has heart that carries it through the troubled times. I like that. Now bring me more Kang-joo. And more kittens. Also, the sudden reappearance of a near stranger clutching what just seconds ago had been cast away into the sea, would freak out most people, leaving them wondering, WTF! For Doo Rim, it just goes unnoticed over her head, showing that at times, our Doo Rim can be quite dense. And you know what? I think there’s only one ghost; she appears in white when it involves Doo Rim but black, when facing Yi Kyung or the Physic. I think the white ghost is somehow rooting for Doo Rim – remember the white ghost holding the road sign, impishly grinning like a prank pulling woman that led Doo Rim back to Kang Joo’s place in an earlier episode? White ghost wants Doo Rim and Kang Joo to be together, I think. And I like! I always thought the ghosts were one and the same. I may not have made that clear in the review!